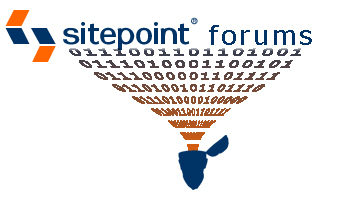 This week at the SitePoint forums we’re all about the gold, baby! The Golden Posts Prize Program, to be specific. Week one has drawn to a close and the winners have been announced. I’d like to congratulate DCrux, deathshadow60, Chroniclemaster1, amabaie, qvalpro and iMeow for their exceptional prize winning posts – they will each be receiving a SitePoint book of their choice. There are three weeks left to run in the competition, so get on over to the forums and get posting. You can read more details of just how to qualify here. Aside from working on the quality of posts, I have also spent some time lately focusing on tidying up and consolidating the numerous forums and sub-forums. When you spend every day at the SitePoint forums as I do, you tend to lose sight of just how daunting they can be to a new member. The place has become a bit of a rabbit warren and some of the forums with great potential (Photography springs to mind) are being overlooked because they are buried so deep. So my next project is to do some re-organising. I’ll be culling a few of the unused forums, moving a few of the valuable yet underutilized forums, and adding that long overdue WordPress forum. So keep an eye out on this Community blog for a further update on that. For those of you that feel you just haven’t discussed enough OOP best practices lately, get on over to the PHP Applications Design forum and you won’t be disappointed! One of the most common moans I hear in this industry is about bad domain names. It’s one of those little things that you have to get right from day 1. So let’s hear your opinion on choosing a domain name here in the Domain Names forum. In these modern times of Google Translate, the need for multi-lingual sites becomes an interesting issue. What’s your take on them? Find out what the Content Writing gurus think. There is an interesting conversation going on in General Chat about web standards and what affect they are having on the evolution of the web. And last up for this week, the Flashers are talking about an interesting tutorial called From Concept to Working Prototype with Flash Catalyst in the Flash and Actionscript forum.